There are four main versions of the M16. 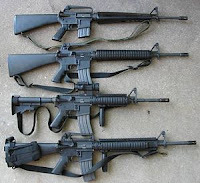 The first one is M16, followed by the M16A1, which uses U.S. M193/M196 bullet. M16 can be fired on the choice of semi-automatic or full-automatic. The second is the M16A2, which came into use around 1980. M855/M856 M16A2 uses bullets that are designed Belgium (and later used as the standard 5:56 x 45 mm NATO). M16A2 can be fired semi-automatic and three-point burst. The latter is the M16A4, which became the standard for the U.S. Marine invasion of Iraq in 2003, replacing the M16A2.